Founded in or before 1855, Lewis-Merthyr Band is the oldest brass band in South Wales' Rhondda Valleys. Originally known as the Cymmer Military and Cymmer (Porth) Colliery Band, Lewis Merthyr adopted its present title in 1949. The band has been highly successful in competition throughout its history, becoming Champion Band of Wales, Welsh League Champions, Miner's Welfare Entertainments (CISWO) Champions and more. ​Lewis Merthyr has represented Wales in the Championship section on eight occasions at the Royal Albert Hall, London, and at the European Championships in Copenhagen, Denmark. The band has also won the Second and Third Section UK titles at the National Championships of Great Britain. Lewis Merthyr is currently ranked in the First Section and were the 2015 Runner-Up WWBBA Champions; 2016 Runner-Up SEWBBA Champions & overall Runner-Up Welsh League Champions in both 2015 & 2016. 2017 was a particularly successful year for the band and saw Lewis Merthyr become the WWBBA and - for the first time in 21 years - overall Welsh League First Section Champions. 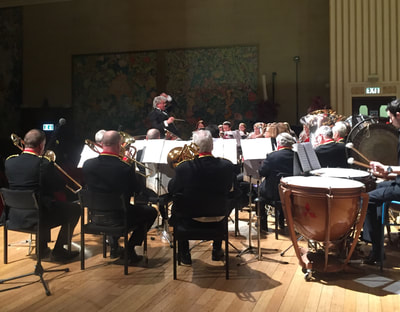 The band has been equally successful on the concert stage, performing at a wide variety of locations across Wales and beyond, including the Royal Albert Hall, London; Llangollen Pavilion; St David's Hall, Cardiff & the Brangwyn Hall, Swansea. Lewis Merthyr has performed for Royalty on a number of occasions, parading through the streets for the visit of His Majesty King George V and Queen Mary to Rhondda in 1912, and the Prince of Wales, later King Edward VIII, in 1932. Throughout its history, the band has performed with numerous leading artists, including "Signor Foli" (Allan James Foley) in the late 1800's, and with Sir Geraint Evans, Glyn Houston and Sir Bryn Terfel. The band also recently featured in a series of concerts under the baton of the renowned Welsh orchestral conductor Dr. Owain Arwel Hughes CBE, including a St David's Day Gala Concert at the Brangwyn Hall, Swansea with Pendyrus and Morriston Orpheus Choirs; a concert in the Speech Room at Harrow School, London; and a performance in Wales' national classical music festival, the Welsh Proms, at the national concert hall of Wales, St David's Hall, Cardiff in July 2018. Lewis Merthyr has featured in a wide range of radio & television broadcasts, dating back to a recently rediscovered BBC Radio broadcast from 1927, and Pathé newsreel footage of the band marching before King Edward VIII in 1932. Most recently the band was featured in the BBC television programme "The Taff: The River That Made Wales" which has been repeatedly screened on BBC Two, BBC Four and BBC Wales. 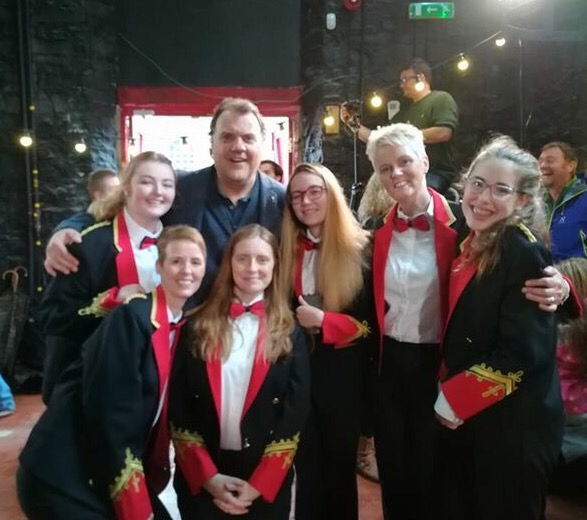 In Autumn 2017, Lewis Merthyr also recorded a special television feature with the renowned international baritone soloist Sir Bryn Terfel, which was screened nationwide on Christmas Day 2017, Christmas Eve 2018 and on the opening night of the 2018 National Eisteddfod of Wales. The band featured again on nationwide television, performing live in the National Eisteddfod, on stage at the Donald Gordon Theatre in the iconic Wales Millennium Centre the following day. 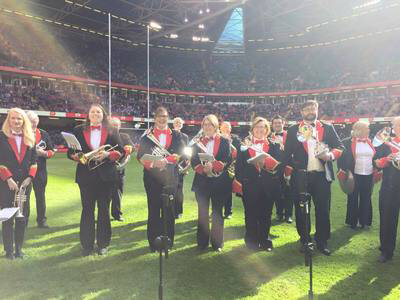 Lewis Merthyr Band has featured in a wide range of major events, performing on numerous occasions at the Principality Stadium, playing to 52 981 people plus international television audience for the Wales vs Italy warm up match for the 2015 Rugby World Cup; to record Pro14 crowds of 68,262 and 62,338 for Judgement Day 2016 & 2018; and for the Opening Ceremony of the 2016 World Golden Oldies International Rugby Festival, which featured 120 participating teams representing 25 different nations from across the globe. Lewis Merthyr also provided Wales' first all-female band for each of Wales' 2017 Women's Rugby Six Nations Championship home matches, and again for the 2018 Women's Suffrage Centennial "Processions" event at Cardiff Castle in July 2018. The band performed again for the Women's Rugby Six Nations matches at Cardiff Arms Park in early 2019 and previously featured in National Theatre Wales' 2016 “City of the Unexpected” Roald Dahl 100 celebrations, performing across Cardiff city centre to tens of thousands of people, which was again featured in national television broadcasts. In April 2018, Lewis Merthyr Band also supported the 11.2 metre "Man Engine" events at Cyfartha Castle and Ynysangharad Park, Pontypridd. Lewis Merthyr Band has a long history of performing and broadcasting new work, and has held a close association with numerous major composers including Mervyn Burtch and John Golland. The band gave the premiere broadcasts of Dr. Peter Graham's "Dimensions" and Goff Richards' "Oceans" on BBC Radio in the 1980s, and in 2018 the band gave the premiere performances of Helen Woods' "Man Engine Anthem" and Dr. Christopher Wood's "Aberfan", also undertaking the premiere recording of the latter on the band's most recent commercial recording "Brass & Voices of Wales" with the massed choirs of Bridgend & Pendyrus, conducted by Owain Arwel Hughes. Lewis-Merthyr remain thoroughly committed to supporting our local community in Rhondda Cynon Taf, through the presentation of concert performances across the county borough and wider, supporting local events & functions, and providing tuition for local young brass & percussion musicians through our Youth Band programme. The band looks forward to continuing to represent Rhondda Cynon Taf and Wales at the highest level throughout all our performances across the nation and beyond. Lewis-Merthyr Band here perform Arwel Hughes' setting of Cwm Rhondda, which was specially transcribed for the band and Sir Bryn Terfel by Christopher Painter and broadcast nationwide on Christmas Day 2017 and Christmas Eve 2018. Rehearsals are held on Monday & Wednesday evenings from 8:00-9:45pm at the Bandroom, 5 Office Street, Cymmer, Porth, Rhondda Cynon Taf, CF39 9AL. All membership enquiries will be dealt with in the strictest confidence. Lewis-Merthyr Band Musical Director Craig Roberts is one of the most well known and widely respected brass band conductors in Wales. He has performed in some of the finest concert halls in the UK and overseas, touring across five continents of the globe and working with some of the world's finest artists. Craig has been successful in competition at the highest level, winning the Welsh League Championship on three occasions; the North Wales Championships twice; and all contests in the Welsh League Championships series. In 2004 he was named Conductor of the Year by SEWBBA and WWBBA for his achievements.